October 25, 2015 – When Jonathan Vaughters took to his twitter account in late August, writing a cryptic tweet about a rider that had just made a step up to the World Tour, one could only guess who would be joining The Cannondale Garmin Pro Cycling Team for 2016. 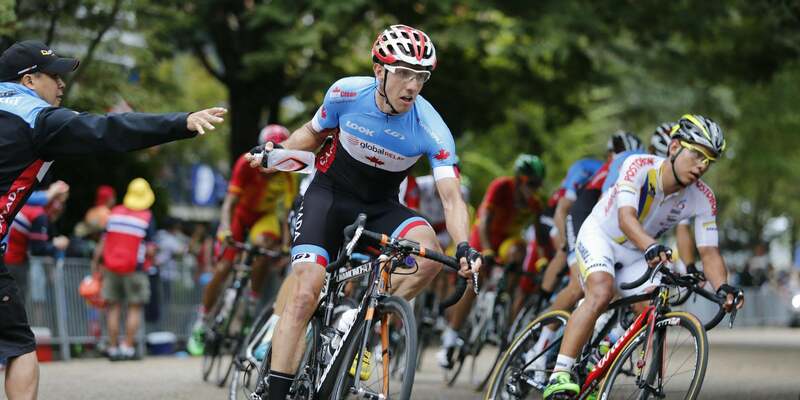 Vaughters’ tweet reads, “What is oxidized, found in trees, runs like a Gazelle, and will be colored green in 2016?” It doesn’t get much more obscure than that, but luckily for us, we knew exactly who Vaughters was talking about – the 29-year-old Canadian, Mike Woods. Woods popped up on our radar after several incredible finishes this season. His 2015 successes included a 10th place overall finish at the Tour of Alberta; 2nd overall at the Tour of Utah, taking the lead after winning stage five and then finishing second on stage six; and lastly, 12th overall finish at the Volta ao Algarve, which saw him battling the likes of Richey Porte, Michal Kwiatkowski and Geraint Thomas for the win on stage 4. We wanted to know more about the up and coming Canadian rider, so we asked Mike five questions as he makes his transition to the World Tour. Peloton: How about a little background on your journey through sports to cycling? Woods: I was very lucky as a kid to have my parents put me in pretty much every sport under the sun. There were few organized sports that I didn’t do, but my biggest passion was hockey. I wasn’t bad at hockey, but I wasn’t great, and by high school I switched my focus to running. I had a lot of success as a runner; I went to the University of Michigan on a full scholarship, I ran on the Canadian National team, and I set a few Canadian junior records, which still stand today, but a series of stress fractures to my left foot ended my career. While trying to figure out what I was going to do with the rest of my life, I rode my dad’s bike to stay fit, and some friends convinced me to start racing. Peloton: What kind of rider are you? We would assume a climber based on your results. Peloton: You carry the nickname “Rusty,” could you tell us where the name comes from? Woods: My middle name is Russell, Rusty is short for Russell. Peloton: You had an incredible year, with some ups and downs, but some very eye-opening performances. Have you had time to reflect and set some new goals for 2016? Woods: Thanks. Yeah it was a pretty special year. At this point, I’ve had four weeks of working on my house, mountain biking and trail running, and a lot of time to think about the past season, and to start planning for 2016. My coach, Paulo Saldanha, and I had a long meeting to go over the previous season and prep for this year. The biggest goal on the calendar is definitely going to be the Olympics. Peloton: Finally, you’re racing for The Cannondale Garmin Pro Cycling next year, what role will you have in the team? Will we see Mike Woods taking up a leading position at any of the races? Woods: I am currently in Aspen this week to meet the team, and prep for the year ahead. One of the goals of the camp is to sit down with the directors and discuss roles and responsibilities. At the moment, I am not completely certain as to what these responsibilities will be, but I have been told that I will have some leadership opportunities. However, I assume that my main role will be to support our big GC guys on the climbs.